For homeowners willing to get a home in Mumbai, Chandak Nishchay is a good option to explore. You can buy a home in this residential complex, strategically located in Mumbai to ensure fast connectivity to the important places around. This location advantage is the key reason behind the extensive popularity of the residential complex. Investors from various parts of the city are interested in buying these homes. You can enjoy a wide range of amenities in the residential complex. The complex comes with 1 and 2 BHK apartments. These are elegantly designed and bring a good mix of sophistication and luxury to the residents. The prices of these apartments range between INR 75 lakhs and INR 1.25 Crs. The estate is located on the SV Road, which makes it easy for the residents to reach the schools, hospitals and other social institutions around. If you are willing to buy an apartment in Chandak Nishchay Dahisar East, this is the right time for you to invest. The prices of these homes are likely to rise in the coming months. Get a classy Property in Dahisar East and live up to your housing aspirations. 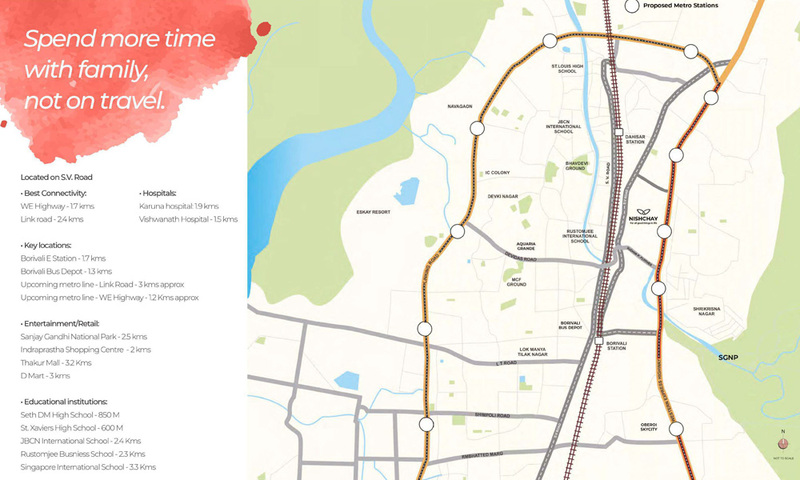 The residents can reach the Dahisar East Station in 10 minutes from the complex. The upcoming metro station in the area will further strengthen the connectivity in the region. The transportation system in Mumbai is well-developed. You can easily get across to the important places in quick time. Commercially, Mumbai is one of the most important cities in the country. The city offers extensive employment opportunities to the residents. The corporate employees are looking for luxary Property in Mumbai. This is a good opportunity for you to get a home here enjoy the wide range of amenities. If you are inclined towards green living, you can get your dream home here. The complex come with landscaped gardens and extensive green zones for the residents. You can enjoy the touch of nature in your homes. The apartments come with elegantly designed interiors. The wide balconies and large windows in the complex bring you a classy abode to reside in. The places of entertainment in Mumbai are located close to the residential complex. You can easily get across to these areas in quick time from the estate. Several shopping malls, bars, restaurants and multiplexes are located close to the residential complex. You can easily reach these areas from your home through the well-developed transportation system. The residential complex comes with a wide range of luxury amenities for the residents. These include swimming pool, gym, various indoor and outdoor games, and so on. The residents can spend quality time in the clubhouse in the complex. The children can play in the dedicated play areas in the estate. The residents can arrange for meetings and conferences in the banquet. The apartments get uninterrupted power and water supply 24/7. For investors and homeowners willing to buy an apartment in this estate, this is the right time to invest. The Chandak Nishchay price is likely to increase in the coming months. Get a quality home here and enjoy the wide range of lifestyle and healthcare amenities. WE Highway - 1 km. Link Road - 2.4 kms. Sanjay Gandhi National Park - 2.5 kms.